The World Food Programme is a branch of the United Nations Development Group that helps food security for 80 million people worldwide, particularly in conflict-torn areas. … Using the lessons learned in this first phase in Pakistan, WFP is now running a full-scale pilot in Azraq refugee camp in Jordan. At present, more than 10,000 Syrian refugees redeem their cash transfers on the blockchain-based system. 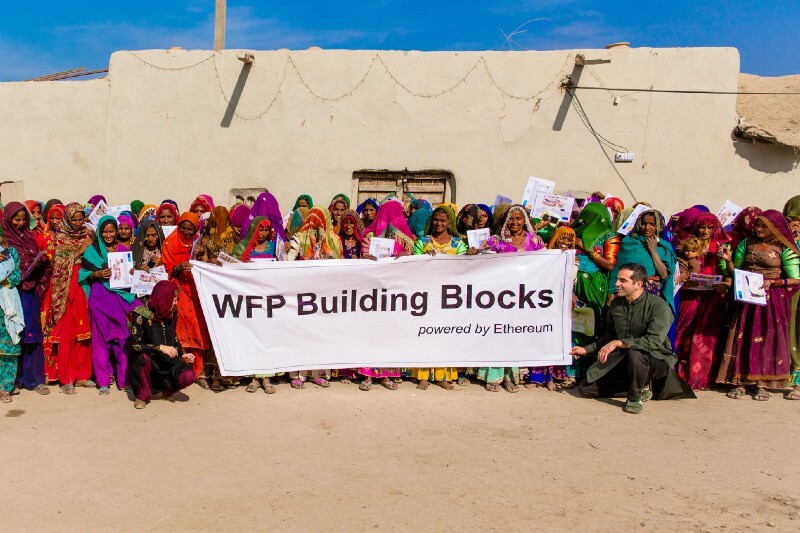 The WFP page on Building Blocks talks about this Ethereum instance (which was private, not public). The first two paragraphs are a fairly standard series of hypothetical Bitcoin promises with the buzzword changed to “blockchain,” before promising various unspecified cost savings for their cash-based assistance programme. WFP is currently piloting a larger, more robust version of the blockchain system in Azraq Refugee camp in Jordan. Currently, more than 10,000 Syrian refugees redeem their WFP provided assistance on the blockchain-based system. As a result of this pilot, WFP will have a full, in-house record of every transaction that occurs at a particular retailer, ensuring greater security and privacy for our beneficiaries as sensitive data does not have to be shared with third parties such as phone companies. This allows for improved accounting and the reduction of third-party costs. Originally scheduled to end on 31 May, the pilot has now been extended indefinitely. WFP will continue to explore use cases beyond cash-based transfers and potentially expand the use of blockchain technology to areas such as digital identity management and supply chain operations. Literally all the benefits of the scheme are stated as possibilities — “could,” “can,” “aims to,” “potential to” — rather than anything that had been tangibly realised in the pilots. The Bitcoin press took to this immediately, as it does. Opp told ETHNews that WFP was cutting fees from intermediaries — though not how it was achieving this, given it’s just changing US dollars to Jordanian dinars before disbursement and keeping track of the disbursement. Futurism added that the platform had been implemented by Parity and Datarella. Datarella’s press release does not detail what they put into the project, but refers people to a CoinDesk article, which doesn’t either. Parity’s Enterprise page mentions the project in passing. This all sounds great! Just the thing to help make a good and useful programme work better. But … what are they actually doing? What are the details? What is blockchain in particular bringing to the party? You’ll be unsurprised to hear that the project is somewhat less than it’s been painted as. The WFP operates the chain itself, although it simulates a scenario where four parties are working together, for future expansion. This is otherwise known as a “database,” which they’re running as a cluster of four redundant instances. There are other benefits, like increased privacy for beneficiaries, and quicker reconciliation of accounts because the agency now operates its own payment network instead of waiting for periodic reports from payments firms. That is, the cost savings — which, to be fair, have been remarkable, dropping overhead to 2% of what it was previously — come entirely from the fact of running it all themselves now. They just happen to use a blockchain as their database. The problem they have now is that nobody else, inside or outside the UN, is interested in joining their private blockchain. Haddad blames “the internecine bureaucracy at the UN and the desire of managers to guard their own turf,” rather than normal people reacting as they usually do to blockchain evangelists with that look in their eyes. edit: not an accurate quote, see comment from Haddad. Haddad is very into doing this on the blockchain in particular — the idea came up in discussion at Singularity University in 2016 (more transhumanists! ), and he only ran this on a private blockchain because the public chain couldn’t handle the transaction load, though he’d still love it on a public chain if zero-knowledge proofs ever make it to Ethereum. Not stated was what the beneficiaries would get from having their payment history and iris scans on the public Ethereum blockchain forever. the hard work is integrating blockchain technology into existing organizational processes — we can’t just hand people a ticket and expect them to get on the high-speed blockchain train. And … you don’t need distributed computing, simulating a competitive cryptocurrency system without the cryptocurrency or the competition, just to manage a database that’s under your organisation’s control anyway. The answer to the gist of your article is contained in the video you have posted of my presentation at Devcon3, starting when I speak about why use blockchain (https://goo.gl/NwtHSp). We have been upfront about the fact that we are using a private Ethereum fork, and that we’re currently the only ones on our chain. The reason we are currently on a private chain is the throughput limitations of public chains and the privacy and security concerns that exist there. For clarity, our Pakistan proof of concept was on a public chain, and based on the learnings, we deployed our Jordan pilot on a private one. The reason that we are currently the only ones on our chain, is that the project is less than a year old and blockchain is a new concept in the humanitarian world. We have been reaching out to our sister agencies and humanitarian actors to see how we can explore this exciting space together. We are looking forward to what the technology has to offer, not only now, but also in the future, above all, empowerment of the people we serve. We have just begun to put in place the first building blocks towards that goal. As also noted in the presentation, most of what we’re doing now can also be done on a traditional IT system. However, blockchain is meeting our current needs well, and it provides additional opportunities that traditional IT systems cannot provide. In May we had just launched the pilot and were still waiting to see the results. At this point in November all the aims we had set for the pilot has have been realized. It is understandable that you would like to know more about how our system works, however the fact that you have not found public information about it on the internet is hardly an argument against us. I would argue that a permissioned blockchain, that is operated across organizational boundaries, is not just a database. It provides assurance that everyone sees the same information, without a trusted intermediary. This is subtle but fundamental difference and important in our line of work. As far as Joon’s article, I never uttered the words “the internecine bureaucracy at the UN and the desire of managers to guard their own turf” and this is not a direct quote form me. It is otherwise a great article, and it could have better helped us gain inter-agency collaboration, one our main hopes, with slightly different wording. I was going by the quote from Joon Ian Wong’s piece: “None of the other UN agencies or aid organizations want to play ball so far, Haddad says” – which I read as inside or outside, but I admit could be read as just inside. I did listen through the video, but the audio wasn’t so good on the daily stream capture (I changed it to the clip of just your talk once that was up). > It provides assurance that everyone sees the same information, without a trusted intermediary. This is subtle but fundamental difference and important in our line of work. Fine. Then just use git. 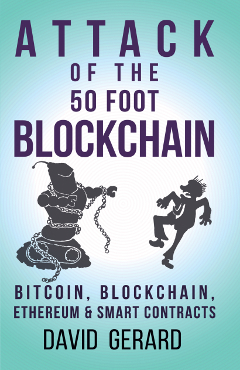 This begs the question: is Git, a distributed revision control system, a blockchain? Git like blockchain, uses merkle trees. A blockchain, in a certain sense, can be seen as a peer-to-peer (P2P) hosted Git repository. In order to modify this repository, users must have a copy of the whole repository and pull the latest commits. When you download a blockchain client and run it, you have to check out the entire blockchain history, much like checking out a Git repo. You could use a Git repository to store a text document stating who owns what. For a more formalized approach, a comma or tab separated file to more closely resemble a spreadsheet. Or even an Excel document if you need programmable functions. And if you need fully executable distributed apps, you could store the source code and check in run results. But this divorces a Git repository from its purpose. A Git repository is useful mechanism for maintaining a distributed version history of content. But when you focus on the content, instead of the mechanism, you’re changing the structure of the Git. The content of a blockchain does not change the structure of the blockchain. With some modifications, for example, to prevent re-writing the Git history with “git push –force” (where is set to a previous state than that at ), and enabling the equivalent of smart contract functionality in Git, you may be able to use Git as a blockchain. But then are we not talking about the same thing? This is really a bit of a stretch. Nobody calls git a blockchain unless they’re attempting to justify calling their git-like non-blockchain a blockchain. 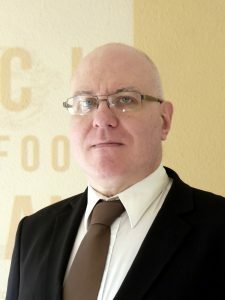 I appreciate they’re similar, and I do think that gitlike structures and software coming into the wider business world outside their development teams will be a net win and might even somewhat justify the “blockchain” hype – but it is actually important that we had git in 2005, and Merkle trees in 1979, and that the good stuff is not original to blockchains, and the stuff original to blockchains turns out not to be much good. I agree, it is stretch. A Git would not serve the purpose our project in this context. To make it useful, you’d have to modify the Git, and at the end you’d end up with a blockchain (i.e. you’d be ‘re-inventing the wheel’). Whether the stuff original to blockchain, namely combining exiting technology in a new way, is good or not, is subjective, and everyone is entitled to their opinion. > Nobody calls git a blockchain unless they’re attempting to justify calling their git-like non-blockchain a blockchain. “Nobody calls git a blockchain unless they’re attempting to justify calling their git-like non-blockchain a blockchain”…You couldn’t have said it better. Thank you for enabling comments on your post. Thank you for your explanation. However, I’m wondering: If you have a permissioned blockchain, don’t you need a trustworthy intermediary, anyway (to grant or revoke permissions)? Couldn’t this trusted intermediary also ensure that everybody sees the same information? Could you explain the benefit of blockchain technology in this particular case? To provide the initial access perhaps, but after that the participants don’t need to trust each other, or the entity that provided the initial access, to have faith in the system. Blockchain shifts trust from individual administrators or hosting providers and puts it in the hands of people running the nodes.